Today, for #ResetTheNet, we’ve partnered with our friends at Fight for the Future to unveil our #SaveTheInternet question push. It’s a grassroots campaign to advance net neutrality state-by-state, from the bottom-up. 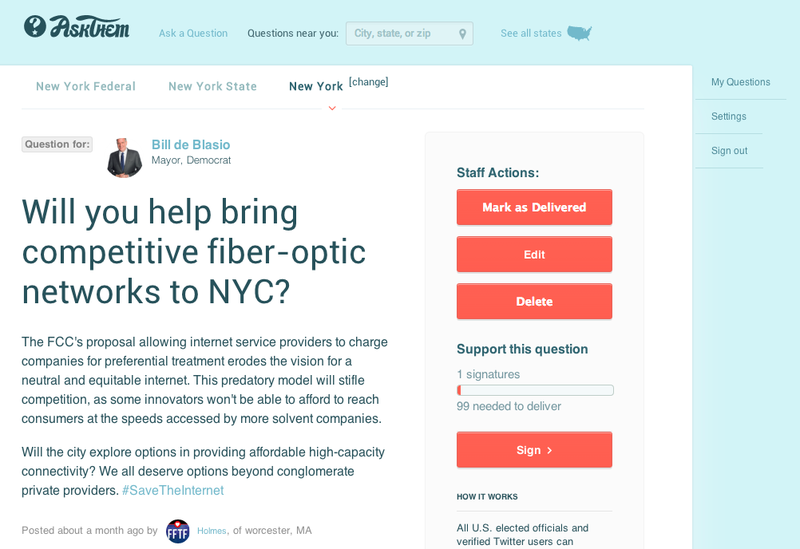 On AskThem, we’re promoting specific policy questions towards city adoption of broadband technology. Sign-on to the questions below – in your state and city – and we’ll deliver them to elected officials for a public response, creating a more continual conversation with government. Then ask your own questions about what your representatives are doing to promote net neutrality, or to the FCC about why you care about digital privacy, using hashtag #ResetTheNet (more info). In light of the Federal Communications Commission’s refusal (update: agreement!) to regulate broadband as a utility, municipalities are making the move to build their own networks with the hope that the agency and national policymakers will loosen creeping state restrictions that impede upon municipal broadband development. From wholesale prohibition of public telecommunications services to hefty profitability requirements, municipal broadband projects are becoming increasingly difficult to execute across the nation. 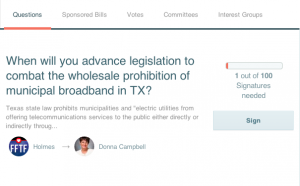 Currently, a broad swath of regulations in at least 20 states restrict municipalities from offering broadband services. Below we’ve compiled a list of Fight for the Future sponsored questions to federal & state senators from around the country. Browse below to check the status for municipal networks where you live! 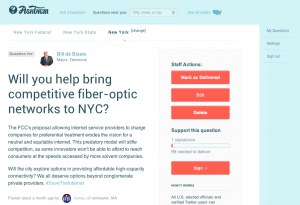 Sign on to support muni-wifi questions in major cities and states, press your state senators about contesting regulations, and ask your Council Members about the procedural steps towards broadband deployment.